What happens when Italian meets Thai? You get a harmonic blend of savoury and spicy, as perfectly showcased by this Creamy Tom Yam Pasta recipe. One bite and your diners will fall in love with this fusion dish. Cook pasta in a pot of salted water, until Al Dente. Drain, and rinse it under cold running water to stop the pasta from cooking further. Set aside. Heat the pan to melt the butter. Add in chopped garlic and lightly fry until aromatic. Add in prawns and stir-fry until cooked. Set aside the prawns. With the remaining butter and garlic in the pan, add in sliced chilli padi. Add in tom yam paste, lemongrass, kaffir lime leaves, pasta water, and mix evenly. Pour in cooking cream, and mix gently under low heat. Add in a portion of the parsley, and mix evenly. Once the sauce is boiling, add in cooked pasta, and mix evenly. 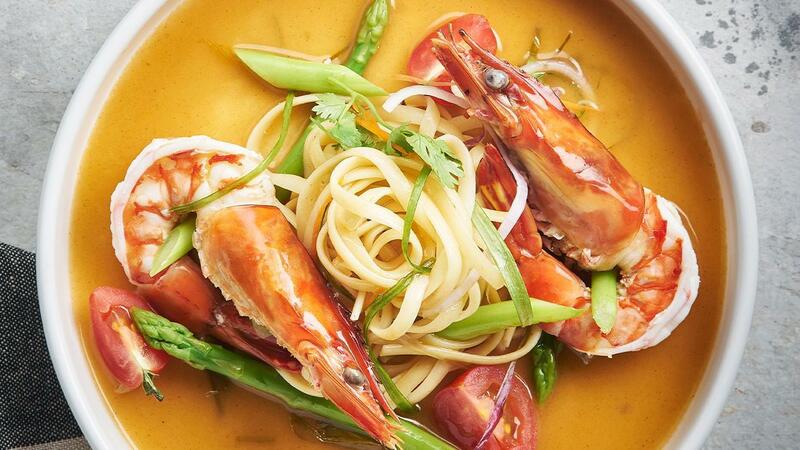 To plate, portion the pasta onto the bowl and place the prawns on top. Sprinkle some parsley as garnish.